At the beginning of the month, 28 players were awarded full-time contracts with an additional seven players handed elite player squad agreements. Natasha Hunt, Kelly Smith, Tatyana Heard and Zoe Aldcroft (who are all part of the set-up at Gloucester-Hartpury) were amongst the 28 named in England’s EPS Squad with the latter three all still students at their respective universities. And Appleby told TRU: “It [the full-time contract announcement] was really welcome news to everyone because the TP 15s [Tyrrells Premier 15s] is all about preparing the players for England and in our case, Wales and Scotland as well. “Three of our professionals are still students. Kelly and Zoe are with us at Hartpury and Tatyana is at the University of Gloucestershire so they are getting the best of all worlds. “For our student players, it is a win-win. They are playing at the top level of the student game as well as the top level of the TP 15s and now England, whilst also completing their education. “As for Mo [Natasha Hunt], she is lucky enough to become a full-time athlete and she is doing some coaching alongside. We are so fortunate that she has come home. She is from Gloucester originally, she is back with her family and I think she is really enjoying being at home. With the RFU now putting more emphasis on the Women’s game at XV-a-side level, it means Tyrrells Premier 15s clubs such as Gloucester-Hartpury will see some of their players spend more time with England, especially with the Six Nations just around the corner. And Appleby feels it is about striking the right balance and also allowing other players to make an impression. “It takes a lot of good communication between us and England,” she said. “For example, at the moment we do have a ‘three-day England week’ so as a club, while we are still in the midst of our league games, it is difficult to prepare accurately for the game on the weekend. “You do have to get that balance because they [England] do obviously want as much time with the players prior to the Six Nations while we as a club are desperately trying to come in the top four! “With these contracts, they effectively own the players. They have the right to pull them from games which they have for this weekend coming, but we know this is part of the game. Whilst Gloucester-Hartpury have athletes competing on the international scene and in the TP 15s - where they currently occupy fifth place in the table - they are also involved at university level meaning the club are continuously building their squad. “The challenge is that there are a lot of games,” Appleby said. “It is a balancing act, but the recruitment side is also huge. “We need to work really hard in recruiting more and more players into the university to bump up the numbers and that comes from our junior programme. Our elite Junior Academy is 16 to 18-year-olds. We still have 35-40 players in our academy and we hope we can keep some of those players to study at uni. "We then get that player for five years; Zoe and Kelly are examples of this and we also have Tabs Copson, Shauna Bennett and Connie Powell who have graduated from the Junior programme and have now continued their studies with us in Higher Education; they are all in the England Under 20s squad. And part of the bigger picture and development which Appleby refers to is Hartpury’s BUCS side. Last season was their first year in the top tier of Women’s University rugby and they certainly made their mark. They won the Premier South title in their maiden campaign and made it all the way to the BUCS Championship final at Twickenham, but narrowly lost in extra-time against the University of Exeter. 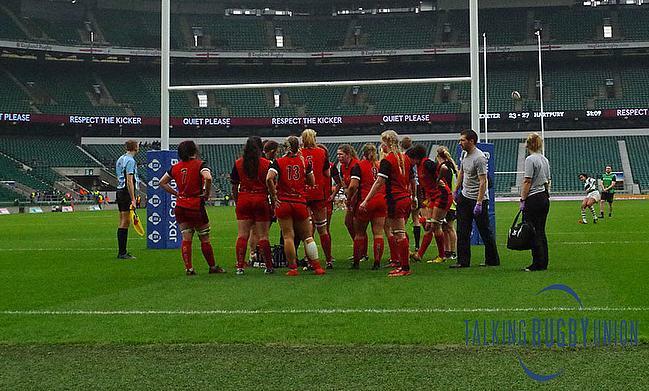 Eighteen of the current Gloucester-Hartpury squad, including Kelly Smith, were involved at England HQ last April and the university team quickly bounced back from their disappointment by claiming the BUCS 7s title in Leeds a few weeks later. Appleby’s current crop of players have lost on just one occasion so far this season and she is hoping for another positive year at university level. She added: “BUCS is going pretty well. Last year we managed to get to Twickers, but we lost narrowly to a strong Exeter side. The trouble is, once you have been to the top, you don’t want to come back from there! “University cycles are difficult because you can get a big turnover of players on any given year. Also, we do have students eligible to play BUCS who also represent their countries so they won’t be playing until maybe the later stages of the competition. “The knock-on effect from that is that we have to strengthen those players who are playing week in week out for the club to make sure we are good enough if we reach the latter stages. There are more players playing in our Uni set-up than there have been ever before and we are just focusing on performing.